The town of Sant Pere de Ribes is located in a tectonic depression in the Garraf Massif. This small basin, known as the Vilanova - Sant Pere de Ribes depression, developed within the Mesozoic materials of the Garraf Massif and became filled by Miocene and quaternary sediments. White fine sands rich in quartz are common within the depression and have been traditionally exploited for cement and glass and these are known locally as saldoneres. The Garraf Massif is formed mostly of calcareous materials and the similarity of the sands with the feldspars produced from the weathering of granite leads to questions of their origin. 1. Draw annotated/labelled sketches of the locations. 2. Construct a sedimentary log. 3. Draw annotated sketches of the different beds. 4. Analyse the sediments and their mineralogy, measuring pebble size, b-axis, grain size, and the degree of sorting. 5. Measure the angle of dip. 7. 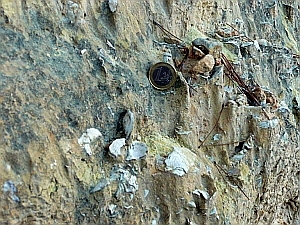 Analyse the fossil assemblage. 8. Comment on risk assessment and geoconservation. What is the mineral composition of the sands sediments? Is there a large or small range? Are the deposits textually and compositionally mature or immature? What evidence exists for the direction of transportation and the environment of deposition? 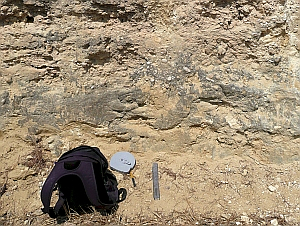 Are there calcareous sediments from the surrounding Garraf Massif within the sands? Are the fossils marine, freshwater or continental? Is there a life or death fossil assemblage?